"Cover her face; mine eyes dazzle…"
The Duchess of Malfi is John Webster’s masterpiece of revenge tragedy, written around 1613 when Shakespeare was writing his final play, and it was performed at The Globe with actors from Shakespeare’s company, including Burbage and Condell. It feels more modern than that, however - despite being set in the early 1500s in Italy, its examination of power, corruption and sexual politics feels very relevant to us here and now. Recently widowed, the Duchess of the title is urged by her brothers (a cardinal and a duke) not to remarry, as they want to re-assert their own control of her at a time when widows were the only women with any power or authority. Instead, she secretly marries her steward Antonio, a capable and kind man who is willing to remain a secret husband and not demand rule over her. Learning of this, her brothers plot their revenge, with the help of Bosola, who begins to doubt his calling as a spy and assassin in the face of the brothers’ relentless anger and venom. Will their hatred and malice defeat their sister’s innocence and hope, or will they end up destroying themselves? Lust, greed, love, fear, hope and anger all wage war in a play that is by turns funny, frightening, moving and disturbing. 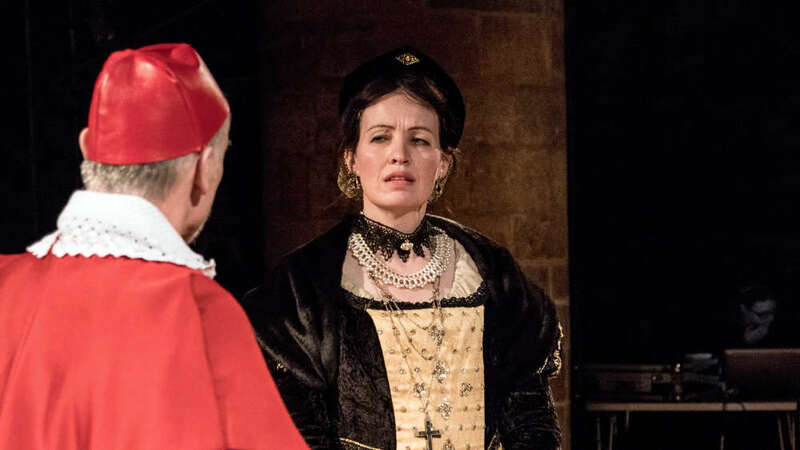 Featuring Nicola Osbourne (Susan in 2018’s Woman in Mind) as the Duchess, with Martin Williams (Gerald in the same play, and more recently Jacob Marley in A Christmas Carol) and Matt Fell (Don Pedro in 2017’s The Rover) as her brothers the Cardinal and Duke Ferdinand, and James Lickman (Laertes in 2018’s Hamlet) as her lover Antonio. The cast of 18 also includes both Alex Rex (as Bosola) and Tamsyn Payne (as an officer and a madman! ), joint directors of Madam Bovary and Macbeth from last year, as well as Bernie Wood (Cleopatra in 2017’s Antony & Cleopatra alongside Matt Fell as Antony) as the Duchess’s maid Cariola, and Megan Lucas (director of last year’s Defying Gravity and Muriel in Woman In Mind) as Delio, Antonio’s trusted friend. Violent and poetical, The Duchess of Malfi is often cited as one of the greatest tragedies of Renaissance drama. Masque Theatre's production is directed by John Myhill.